Students at the University of London today carried out a high-visibility publicity stunt at the heart of the University to highlight the lack of holiday pay for its outsourced workers. 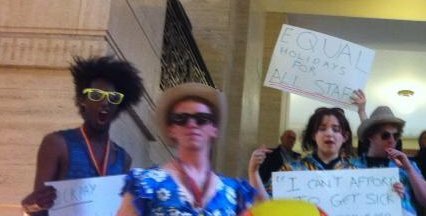 In a stunt focusing on the issue of holiday pay, the students marched into Senate House, the administrative centre of the University of London, adorned with beach towels, snorkels, and panama hats, blasting Calypso music through the corridors of the institution. The ‘holiday-camp’ stunt was part of the ‘Summer of Action’ called by the University of London Union (ULU), the Independent Workers Union of Great Britain (IWGB), and the 3 Cosas Campaign for sickpay, holidays and pensions for all outsourced staff at the University.